As the amount of data your company creates continues to increase exponentially, finding a cost-effective and dependable solution can be hard to find. Limited budgets mean that data storage managers need to get creative with how they tackle their storage needs. LTO technology offers the solution. At 1.3 cents/GB, LTO-6 technology is the lowest cost for storage in the foreseeable future in the data storage market. Initial cost isn’t the only benefit however, as LTO tape continues to offer the best cost per gigabyte over the entire life span of the data when compared to other options. In fact, according to a study by industry analyst firm ESG, a data dedupe virtual tape library was 2-4 times more costly than tape. When it comes to long-term archiving, storage managers have to think about a lot of factors: equipment, media, maintenance, energy costs and floor space. Since costs for each can be significant, it’s crucial that they maximize data capacity while minimizing recurring costs. 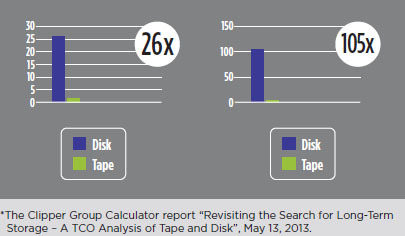 The Clipper Group found that the average disk-based solution costs 26x the total cost of ownership for an average tape-based solution, as the energy costs to spin the disks exceed that for tape. Disk isn’t a space-saver either, as they also found that a disk-based storage facility uses 4x the amount of floor space than that of tape. Their overall conclusion was that the more data that can be preserved on tape, the lower the overall total cost of ownership. Consuming zero energy on the shelf, LTO tape offers the most energy-efficient and cost-effective method for storing your data. Now you can use that money you’d be dumping into another storage solution to where your business needs it the most.